“Breathtaking” is not a word often used to describe a book. Nor is “sumptuous,” although, in the case of Joni: The Joni Mitchell Sessions, the term is surprisingly apt. Sessions is oversized, even by coffee table book standards. And being published just a few weeks after Mitchell’s 75th birthday, it is timely celebration of the woman and her art. Joni: The Joni Mitchell Sessions is populated by myriad photographs of Joni Mitchell—Joni singing, Joni gesticulating, Joni posing, Joni mugging, even Joni swimming, and, always, Joni smoking, smoking, smoking—all the product of famed rock-and-roll photographer Norman Seeff, as well as some well-written commentary by Seeff as well. What sets Sessions apart from the many other books on Joni Mitchell and her work is the concept of those sessions themselves. As Seeff explains it, he first met Mitchell when the art director for her album Blue first introduced them by suggesting that the two might do a photography session together. Both were young. Both were starting out—Seeff didn’t even have a photo studio set up yet and so had to visit Mitchell’s house for the shoot. And it was Los Angeles in the ’70s. Over the decades that followed, the two continued to work together in a number of other sessions, many of which came to combine photographic portraits with in-depth interviews and videos as well. Gathered here, the results of those sessions make for a work that is as arresting as it is unique. And also for the rare coffee table book whose copy is as interesting as its photography. “In 1996, I asked Joni if she would come to my studio for a conversation that I wanted to include as part of the text for a book I was publishing. As the end of our two-hour conversation, as Joni got up to leave, she stopped for a moment, turned, and looked directly at me. ‘So,’ she says, ‘what have you learned from all these years of work you have done on yourself?’ I am taken aback. I am not even sure this is a question. I do not pick up the rope at that time of having to explain or justify myself, and later forget the incident. “Now, three decades later, in the process of creating this narrative, the incident comes back to me. In many ways, it was more my question to myself, and answers have come in the evolution of my personal inner and outer journey. Note that, while Joni Mitchell’s question is the object of the story, if you will, the thing that set the anecdote in motion, the subject was Seeff himself. And so it is for much of the narrative, as the book, like the sessions, explores the ways in which artists collaborate together, spark together, and, in revisiting each other periodically throughout decades, evolve together. 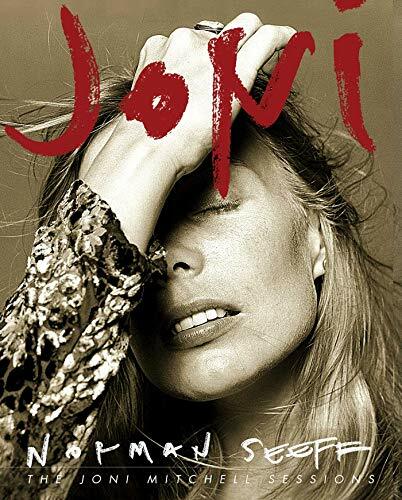 But make no mistake—this is a book of photos and the subject of those photos is Joni Mitchell, and, safe to say, no one has ever taken better, more exciting or more soulful pictures of her than has Norman Seeff. The most arresting of the images is one that runs across two of the book’s oversized pages. Cropped just below her slack mouth, Mitchell is shown as a Medusa, her curled hair spilling across the pages, her eyes direct to the camera, with power enough within them to transmute the viewer to stone. There is something truly fascinating in the timeline of this book as both photographer and subject age as the pages are turned as Mitchell goes from folk singer to pop singer to rock singer to jazz singer. And as she transforms from the girl who giggles in the front seat of a junked car to the chick in the bikini doing backstrokes in her swimming pool to the mythic dark icon in feather and fur crow drag that she dressed herself in for the cover image of perhaps her best album, Hejira. What surprises most about these images is how often Joni Mitchell is captured laughing. How her face seems to naturally radiate joy. Other surprises include how many cats she seems to have had over the years and how often her fingernail polish is chipped—as is she could not be bothered, in spite of the photographic record, to remove the old polish or have it replaced. The reader notices as the sessions fly by, that the photographer and his subject come to trust each other more and more as the years pass, and that, as a result of this trust, the emotional truth of the portraits pierces deeper with each new session. Near the end of volume, Seeff notes that “In the throes of the creative act, the physical expression shifts into a body language generated by the inner emotional state. It is a shift beyond the superficial vanity to a beauty from within,” and the reader suddenly understands Seeff’s recipe for success. That he, the photographer, is managing to capture not just Mitchell’s natural blond, blue-eyed beauty, not just her well-earned star status, but also and more importantly her inner self, her intensity, her musical genius. And her genius, when seen, is a beautiful thing. It is obvious to the reader that Seeff admires Joni Mitchell. And that he has found their collaboration of be in equal parts challenging and rewarding. In the end, he pays Mitchell her due, calling her an “Innovator, Mapmaker, Visionary and Dreamer.” That he himself shares some of these attributes has been the basis for their powerful collaboration and for this truly superb book. Joni: The Joni Mitchell Sessions is a perfect belated birthday gift for Ms. Mitchell, and an essential volume for her many fans. But beyond that, as an exploration of the creative bond, Sessions makes for a great addition to any coffee table or bookshelf.